It’s confession time again. Seven years ago, when I was a first time mother, I was introduced to The Wiggles. At that time, they were part of Playhouse Disney and on several times a day. Now, The Wiggly Waffle is part of Sprout, which we sadly do not have on Time Warner Cable – BOO!. When I first saw Greg, Anthony, Murray and Jeff, I didn’t know what to think. As a teacher, I was familiar with other children’s musical groups, but not this Aussie sensation. The true confession is I was not a fan at first. I would quickly turn off the television when The Wiggles would come on because I just did not get them. My tune (pun not intended) changed when my son perked up and wanted to dance to their music. As a curious new mother, I looked at the background of the group. It was interesting to see that The Wiggles are educators. After a few shows, I was hooked. I liked the messages in their songs, and I especially enjoyed how the group managed to get kids and parents up off their rears to dance together to fun and catchy songs. 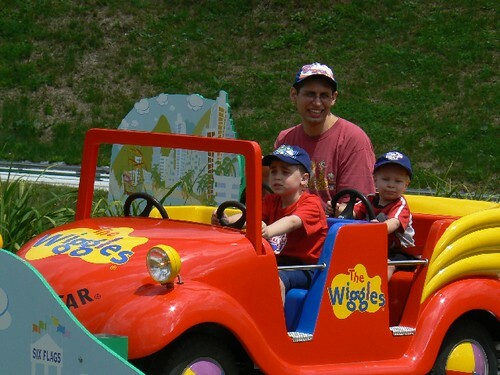 Fast forward seven years and we have been to three Wiggles concerts (and counting – I hope), own a lot of Wiggles DVDs and CDs, and frequently go to Wiggles World at Six Flags. We were at a concert just weeks before the official announcement of Greg handing over the yellow skivvie to Sam. These were big changes for kids and parents alike. We mourned losing Greg and wished him a speedy recovery, but looked forward to the future with Sam. Recently, TechyDad and I were contacted by The Wiggles PR team to check out their new DVD called Hot Potatoes! The Best of The Wiggles (Amazon Affiliate link). The most successful children’s entertainment group in the world has finally released a collection of their most loved songs, Hot Potatoes! The Best of The Wiggles. 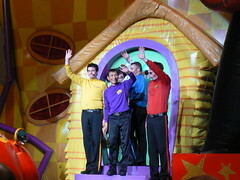 The Wiggles’ songs have drawn millions of people over the years to see their live concerts. The New York Times called The Wiggles, “the band that rocks the cradle” and this is certainly true. They have set records for their sold out performances everywhere from Madison Square Garden in New York to the Hammersmith Apollo in London to their home town of Sydney, Australia. Their songs are instantly memorable and get you wiggling in seconds! Those same songs have seen music royalty line up to record music with the fab four of fun! We’ve picked the best for you to listen to, but snap it up as this DVD will go like….hot potatoes! In addition to the songs listed above, there are a lot of special features on this DVD. A few of them include interviews with The Wiggles’ Mums, Original clips from 1991, and Growing up with The Wiggles (Clare and Larissa). Some of the special guests that are on the DVD are Kylie Minogue, Leo Sayer and Steve Irwin. As I mentioned before, we have a lot of other Wiggles DVDs at our house. Still, I think we have a new favorite Wiggles DVD. From the moment we put the DVD on, both of the kids were actively engaged. Hot Potatoes! The BEST of The Wiggles is chock full of Wiggly classics. As a parent, I really loved that before each song one of the familar Aussies comes out to introduce the songs. This really worked well with the flashback style that was used on the DVD. Yes, each of the songs is in the original format from their television show, DVD or live performance. Thanks to this, we are able to see both Sam and Greg in the yellow skivvy. The other items that I really enjoyed were the extras. It was so much fun listening to the Mums of The Wiggles talk about their little boys. The women really were a hoot and we were able to learn a lot about Anthony, Murry, Sam and Jeff. My older son also enjoyed the section with Clare. Clare is Anthony’s niece who has grown up around the Wiggles. She appeared on earlier shows with them and now travels as one of the Wiggly Dancers. NHL recalled seeing her long ago and when we went to the Go Bananas show last fall. 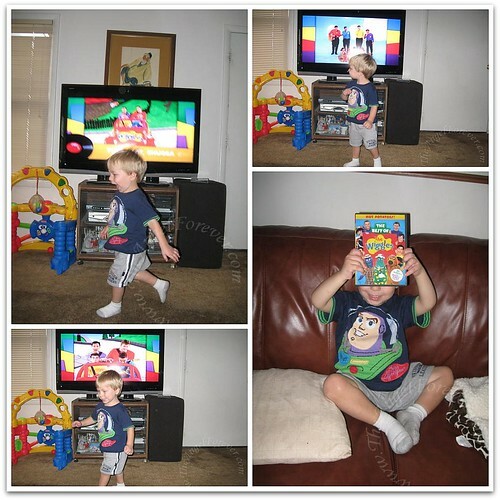 From the moment the DVD went on, he was non-stop singing, dancing and running around. He loved each and every song and asked for it again. When I asked what his favorite was, he said Popcorn. If you are a Wiggles fan, we highly recommend adding this to your Wiggly collection. The best part, you could win a copy here! Thanks to The Wiggles, one lucky winner will receive their very own copy of Hot Potatoes! The BEST of The Wiggles DVD. MAIN RULE – Answer the following question: What is your all time favorite Wiggles song? Yes yours, not your childs (will be asking another bonus question below). 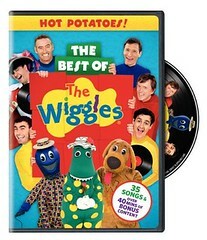 1 Bonus Entry – Who will this DVD be for and what is their favorite song by The Wiggles? 1 Bonus Entry – Who is your favorite Wiggle or character from The Wiggles and why? 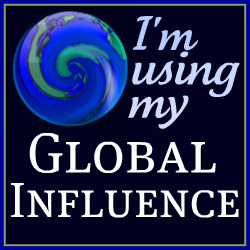 1 Bonus Entry – Leave a comment on any of my non-giveaway posts from the month of July/August. Leave a comment here to let me know which one. This Bonus entry may be done only twice per person. To enter, please follow the rules above within the comment section. Contest starts today August 19 and ends at 10:59 EST on September 2 , 2010. You do not have to be a blogger to enter, but must leave a valid e-mail address for me to contact you for mailing address once the giveaway is over. I will select the winner using random.org and contact you via e-mail. You will have 48 hours to claim the prize. If there is no response, another winner will be selected. Open to U.S. and Canada residents only. Also note that TechyDad is having a giveaway on his website where you increase your chances for another DVD there. Disclosure: I received this DVD complimentary of The Wiggles PR agency in order to facilitate this review. They were also sweet and sent a few other Wiggly surprises for my sons that included a T-shirt, CD and Henry the Octopus doll. No other compensation was given. The opinions expressed in the review are my own and you can see we have been long time Wiggles fans. 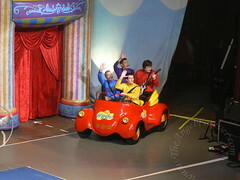 The Wiggles are also providing the giveaway item to my readers. 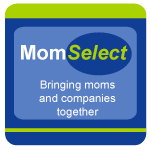 I love several of them, but am not sure what the titles are… we both love Rockabye Bear, but Elbow to Elbow is a close second! This will be for both of my kids, but my son is the singer and dancer right now. He loves “Point Your Fingers and Do the Twist” … or whatever the title is? I like Captain Feather Sword & Jeff… they both crack me up! How often does a character become known for sleeping? Or tickling people? I like Toot Toot, Chugga Chugga, Big Red Car. This will be for my friend’s daughter. I think she likes Lights, Camera, Action, Wiggles! My daughter likes Captain Feathersword because he’s silly. My fave song is Hoop Dee Doo…and yes, when it comes on, I do the WHOLE dance!!! Thank you to everyone that entered the giveaway and to the Wiggles PR for making this possible for everyone. The giveaway is now closed and the winner will be notified by e-mail soon.